If you haven’t noticed, the popularity of the ukulele is taking the country by storm. The only way you wouldn’t have noticed is if you lived on a secluded island. Even then, a ukulele could have easily washed up on shore. Why is this happening? The popularity of the ukulele is being fueled by its use in popular music. Other reasons include the facts that it is easy to play, fun to play, affordable, and portable. Why a New Method – Specifically for Classroom Ukulele? As Director of Curriculum and co-owner of Consonus Music Institute, I have spent the last several years presenting clinics and MEA conferences throughout the country. I’ve presented guitar sessions on a wide range of topics including many that are designed to help guitar instructors with their teaching. I would often attend ukulele sessions at the conferences and talk with teachers who are either using ukulele in the classroom or teaching ukulele classes. I have presented many ukulele clinics myself where I gained great insight into what teachers need in a ukulele method. I discovered that teachers wanted a simple, sequenced approach to teaching chords, accompaniment styles, playing single note melodies, ensembles, and a bit of theory. So, I set out to create the method that would be most beneficial to both teachers and students. The result is Basic Ukulele, a ukulele method that gives the teachers and students what they want and need in an easy-to-follow, easy-to-learn, pedagogically sound approach to learning to play the ukulele. This new method is divided into sections: Getting Started, Warm Ups, Strumming Chords, Strum Patterns, Reading Tablature, Combining Tablature and Chords, Theory, Ensembles, and a Song Section. 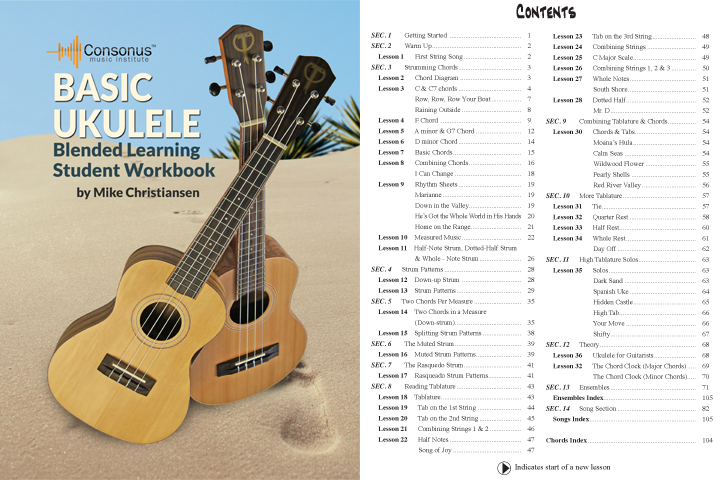 Within each section are sequenced lessons containing exercises, songs, and solos to develop the skills to play accompaniment and solo ukulele. The chord sections show chords and strumming patterns that can be applied to play songs in the section and virtually any song found in sheet music or music books. The tablature sections show how to play single note melodies, and melodies combined with chords. The ensemble section contains lots of ensemble pieces written for two, three, and four ukuleles in a variety of musical styles. The theory section shows teachers and students how to find which chords go together in the keys. Knowing the chords in a key is extremely helpful in writing chord progressions and playing by ear. The songs section provides a single location where dozens of songs to which the strum patterns can be applied are found, rather than having to search through the book to find the songs. Great attention has been devoted to making sure that each skill is an outgrowth of a previously learned skill, and the development of ability is gradual and fun. Like the Consonus guitar method, Basic Ukulele comes with the same format of audio and video presentations. Each section is supplied with video instruction teaching the skills presented and used to play the material in the section. There are audio recordings of all of the exercises, accompaniments to songs, solos, and ensemble pieces contained in each lesson. Students and teachers can play along with the recordings using their computers, ipads, phones or ipods. The advantage to playing along with the recordings is that, in addition to allowing you to “flip your class,” it improves accuracy and makes learning fun. After you have registered at cmilearn.org, logging on to the Consonus site is very fast and user friendly. Like all of our courseware, the price of Basic Ukulele is unbeatable at $15/book and online student licenses for $10/student for a school year. The book can be used by itself, but to get the most out of the method and learn the quickest and most efficient way, the best approach would be to use the book and the online material. Teachers may want to purchase the online material to show the videos and use the audio in class or to “flip their class,” a teaching model that allows students to study ahead and come to class already familiar with the new concepts. The Basic Ukulele book is available now and the online material will be available in the first part of August, 2017. If you want to combine your ukulele and guitar classes in a concert, two of the ensemble pieces in the ukulele method, Puerto Escondido and In The Mirror, can be played with the guitar ensemble arrangements of those same two pieces that are in the Consonus Guitar Fundamentals Beginning book. No transpositions or adjustments need to be made. The guitars can play the music of those two ensembles written in the guitar book, while the ukuleles play the same two titles from the ukulele book. They will sound great played together. Also, there is a way to play all of the ukulele ensembles and solo pieces from the ukulele book on guitar so the guitar and ukuleles can play together. To have the guitars play solos and ensembles from the ukulele book and sound like the ukuleles, have the guitarists place a capo in the fifth fret. With the capo in the fifth fret, when the guitars play the music from the ukulele book, the notes and the chords on the guitar will have the same fingerings as they do on the ukulele. I hope you have a great time expanding the reach of music in your schools with this new Basic Ukulele curriculum!